It's the 4th of July - a good enough excuse to go out for dinner. There's always something new to try on the menu but there's the added bonus tonight - truffles! As Alastair informs us, there's a truffle war on at the moment. Hurrah! Three cheers for the truffle war. With so many truffles entering the market from Tasmania, Victoria and WA, the laws of supply and demand come into play and we the consumers are the winners. 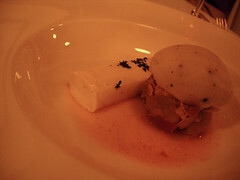 Tonight, the restaurant is offering a $15 truffle supplement - truffles will be added to whatever course you like. I really don't have to say that we took up this offer - opting for a double dose of truffles. 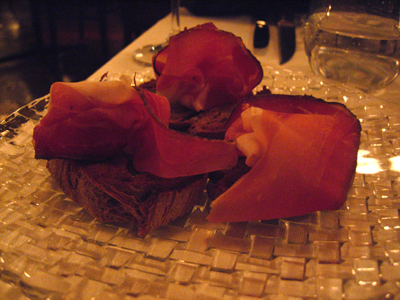 wafer thin slices of in-house made speck served on their own rye bread. I just love the smokiness you get combined with the moistness of the flesh. 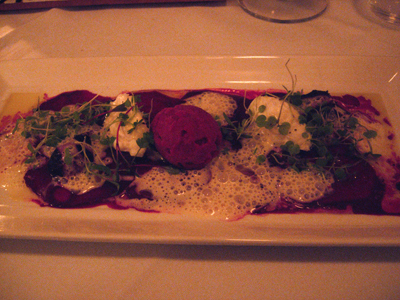 Paalo has the Beetroot Carpaccio with whipped Meredith dairy goats cheese, aged balsamic and horseradish. 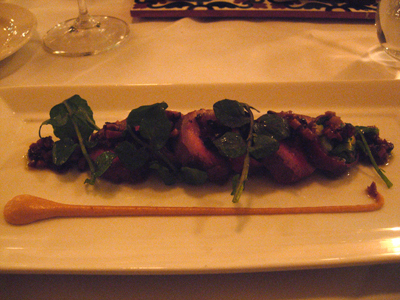 This is one of the serves of truffle - which is destined for Paalo's main. 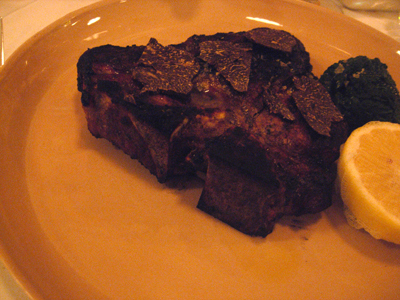 Paalo ordered the Bisteca Fiorentina and here it is with the truffles placed upon it. 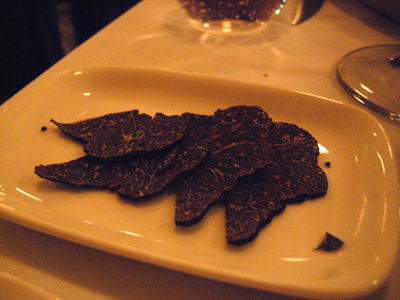 The heat of the streak really brings out the truffle aroma - this is one of the better ways of enjoying truffle. 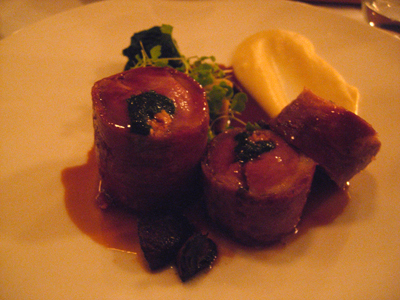 I have a truffle free main of roasted duck breast rolled with prosciutto and foie gras, duck leg cannelloni and parnsip puree. 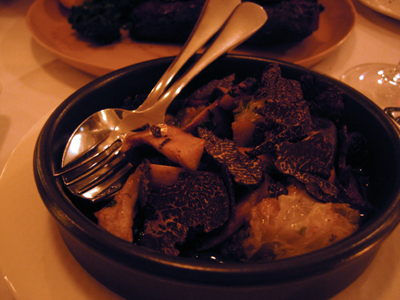 We also order the side dish of wild and gathered mushrooms that has been topped with another serving of truffle. If you only order one serving of truffle then opt for this one. Unlike the beef this came out with the truffle scattered over the top and so had really started giving off those great aromas. 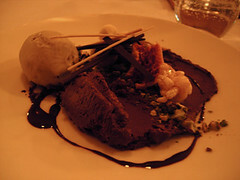 It's textures of chocolate for me and vanilla bean pannacotta for him. My advice - hurry in for truffles while the war is on! One world of advice - please don't eat them off the plate put them on your food and let them get some temperature into them.